They say you can’t have a fire without a spark. But for WSU’s Asa Reyes‑Chavez, a fire is what sparked her interest in becoming a researcher. Last summer Reyes‑Chavez joined Amanda Hohner, assistant professor in WSU’s Department of Civil and Environmental Engineering, and her team of researchers to investigate the impact that erosion from wildfires has on water quality. The project granted her a unique opportunity for hands‑on learning. A sophomore civil engineering major, Reyes‑Chavez attended Puyallup’s Governor John R. Rogers High School, where she earned her associate degree through the Running Start program at Pierce College. Once at WSU, she became involved in a variety of activities on Pullman’s campus, working as a tutor and teaching assistant and participating in clubs, such as the Society of Women Engineers. She received a grant from the Washington Research Foundation for her work with Hohner. Hohner is investigating how the Norse Peak Wildfire, which burned in Washington state in 2018, impacted the water quality of the Naches River, which the city of Yakima uses for its drinking water supply. Following a fire, there can be enhanced erosion of soil and debris into surface waters that may result in contaminated water supplies. 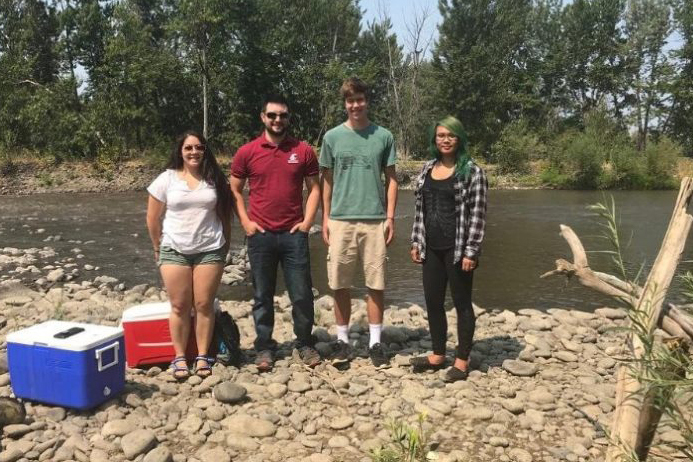 Reyes‑Chavez, along with student researchers Jered Newcomb and Elizabeth Crain, have been collecting and analyzing samples from the Naches River at the Yakima water intake and running tests to simulate the process at the water treatment plant. Wildfire is of increasing concern globally, including in the Pacific Northwest, said Hohner. Working in collaboration with the Yakima Drinking Water Utility, her project focuses on the aftermath of a wildfire, which isn’t always at the forefront of people’s minds when they think of fires. “Our goal is to help Yakima assess the vulnerability of its water system and treatment process to post‑fire water quality changes,” Hohner said. Students Asa Reyes‑Chavez, Jered Newcomb, Noah Leibnitz, Elizabeth Crain, l‑r. Research challenges students to look at a topic that they likely wouldn’t be exposed to in class, while forming connections to their everyday lives. Students are introduced to field and lab work, which teaches them hands‑on skills. During the wildfire project, Reyes‑Chavez got to go visit Yakima after a rainstorm, which brought more erosion and resulted in the city having to shut down the treatment plant and rely on groundwater supplies. Every year, undergraduate students can gain research experience through WSU’s Summer Undergraduate Research program. For more information and to apply, visit WSU’s Office of Undergraduate Research.